Imagine, if you will, a theoretical macro-brewed lager. Crisp, straw-coloured, unchallenging lager. Now, try to imagine what its opposite would be. You could be imagining the 8 Wired Feijoa Sour. 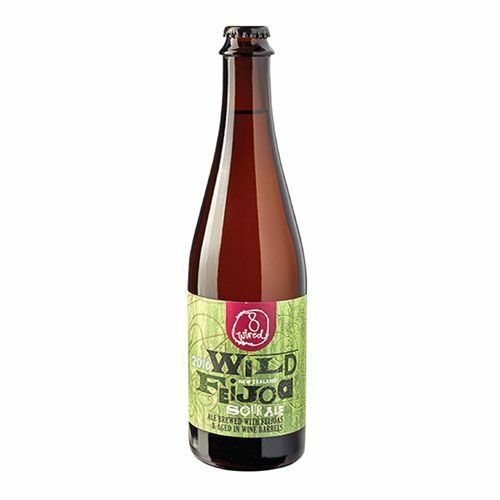 Different in almost every regard: a sour lambic beer brewed to a quite emphatic 9.5% alcohol, flavoured with New Zealand feijoas and aged in Pinot Noir barrels. It should be noted that where other breweries may flirt with barrel ageing, it’s a big thing at 8 Wired – at around 220 full casks, they probably have the largest stocks in the Southern Hemisphere. This is a rippingly sour beer, one for adepts. Also, its fruit flavours don’t remain in the background like some beers in similar styles, so you’d best enjoy the Kiwi speciality. If you can check those particular boxes, this is an absolute treat – surprisingly refreshing for a beer so packed full of flavour.